NOTE: This Website is owned by me (EJITEX) no third party, and this Website is sponsored by Google Adsense (GA). CAUSION:This Website may contain (s) links that redirects to another website (s) that are not owned or controlled by Ejitex, Please be aware that we are not responsible for the privacy practices of such other websites or third-parties and please Don't forget to comment and share this post you are about to read to your social media accounts also share to your love ones on social media. TEcno Mobile, has dropped a hint on the social media about its next flagship device. 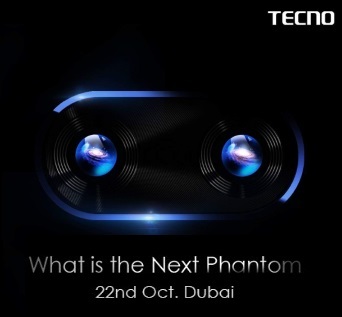 After launching series of the low-end devices like Spark K7, WX3, and others, the brand is set to announce a new Tecno Phantom phone that will be unveiled on October 22, 2017 in Dubai. 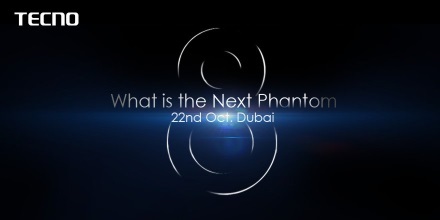 The new device will be added to the Tecno phantom series, which kicked off with Phantom 5 few years ago. This could be the perfect Christmas gift we've all been waiting phone, as the yet-to-be announced phone poses as a successor to last year's Tecno Phantom 6 and Phantom 6 Plus. There is no official confirmation of the new device's name at the moment, but it could be called "Tecno Phantom 8", with the sister (upgraded) version coming as "Phantom 8 Plus". In terms of specifications, the flagship smartphone might feature a 6-inches display, 4GB/6GB RAM, 64GB ROM, fingerprint scanner, and Android 7.1 Nougat. According to image renders, it looks like the phone will feature dual rear camera setup of 21 megapixels. The Tecno next Phantom will surely going to be another crown jewel Smartphone. In the sense that the Phantom series is the only Ffagship of Tecno Mobile. The recent device of the Flagship family Phantom 6 Plus has remained a Beast and it is hoped that the New Phantom 8 will be a super Beast. Meanwhile, if you want to enjoy major goodies that follow a smartphone like privilege to upgrade to any latest Android OS earlier, always buy flagships. Users of Phantom 6 Plus are privileged to receive OTA Upgrade to Android 7.1.1 earlier because their device fall within the flagship family of Tecno Mobile and it is highly hoped that Phantom 6 Plus and the upcoming Phantom 8 will receive OTA Upgrade to Android O. The Next Phantom may even originally come with Android O. Until officially confirmations, let's keep our fingers crossed, and take this opinion with a pinch of salt. We create blog / website, we host blog and website, we change website and blog Template with easy to navigate Template. 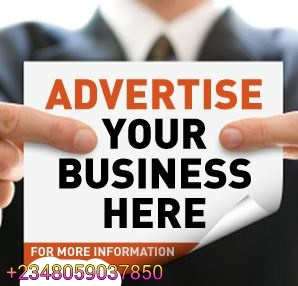 To contact us use our contact form or phone numbers or Email: infoejikelazrus@ejitex.com , for relevant information send it using the email or phone number above. 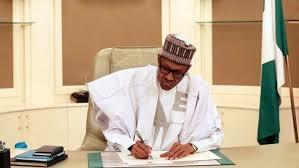 Okorocha absent as INEC presents certificate to senators-elect.